As a protectress, Achi is visualized on her blue wisdom horse to symbolize the swiftness of her enlightened activities, and she holds a wish-fullfilling jewel to symbolize her ability to bestow everything needed and desired when asked. 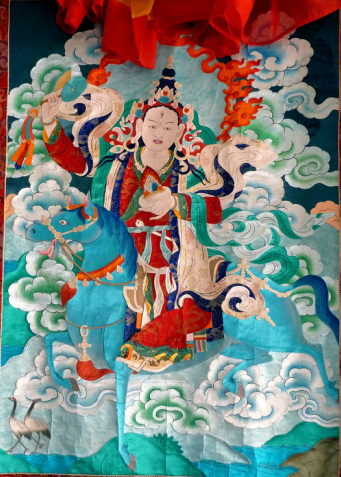 She vowed to protect the Drikung Kagyu lineage and its practitioners, removing inner and outer obstacles to practice and laying the groundwork for circumstances best suited to our progress along the path. 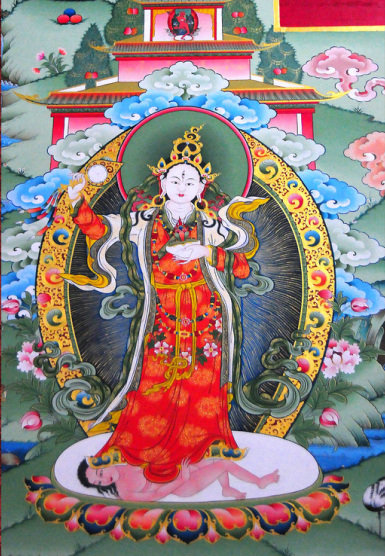 Those who practice her meditation and recite her mantra are sure to be protected from obstacles and hindrances. Mother Achi was the great grandmother of Lord Jigton Sumgon, founder of the Drikung Lineage. To this day she remains a great dharma protector of the Buddha's teachings. Although Achi has a particular committment to protect the Drikung Kagyu, she is recognized and practiced by all lineages of Tibetan Buddhism. At the time of her death, Achi Chokyi Drolma did not pass away in an ordinary manner. She first took her disciples to a huge cave where many sacred and secret items were discovered. Then she offered a tsok feast, and those who partook of that feast achieved many sublime qualities of the Buddhas. Then Mother Achi composed a text containing a sadhana of herself and promised to look after the teachings of the Buddha in general and to protect the essence of the Buddha's teaching that will appear in the future. With that she said, “My activities through this body have come to an end,” and she flew up to the Buddha Field on her blue horse without leaving her body.